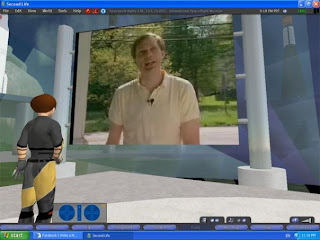 Hello everyone, this is Wlfric Gausman, a new blogger for Second Life Children. I would like to start out by telling you a little about myself. I am a regular at the Whippersnapper sim and own land right next to our own SLC Learning Tree and I am a DJ at the Vortex Club not far from there. I am a twelve year old SL child and I love to script, build, sculpt, DJ, and play with toys both big and small, but my favorite thing to do is just hang out and pal around with my good friends. 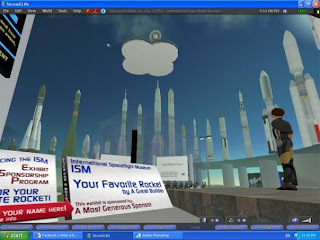 My blogging will be mostly about exploration as that is one of the funnest things to do in Second Life. I will blog about places that would be of interest or fun places to play for children of any age. I will start off with one of the very first places I went to upon leaving the Help Island over a year ago. As you can see, these first three pictures were taken with a much earlier viewer (and a much earlier me as well). 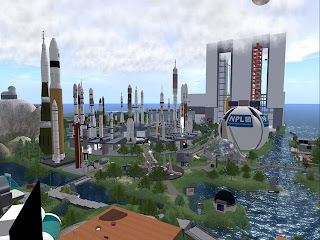 Yes, I started my second day in Second Life as a child. I figured since we could be anything we wanted to be, I wanted to be a boy again. Little did I know that I was not the only person in Second Life with that idea. The rockets are just a very small part of this exhibit. Above them on the platform is a representation of our solar system with the planets in proper scale from the sun and with the times of their journey around it above them. Above that is a model of the international space station. There are many more exhibits to see, including a planetarium, a rocket ride in a Gemini Rocket (no relation to a Gemini Enfield, thank goodness), a model of the hubble telescope and the international space station. This sim is honestly one of the reasons I became hooked on second life. In the picture on the right is the video screen with the live NASA TV stream that is constantly playing video from latest space launches to explaining the technology to what exactly the astronauts are doing on the particular mission. It is very educational and interesting. The last picture is the sim as it looks now, with the windlight viewer, on highest settings of a very high powered video card. 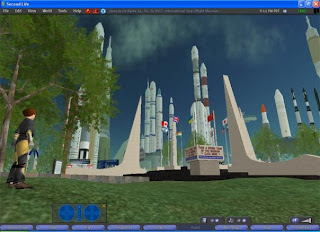 Nice to hear about the Space Park, i'll visit it soon! The difference in the first pics and the later ones are amazing, haven't we come a long way? I am so glad you shared about this place! My Daddy and I went to check it out and had a total blast! Hope you keep sharing more fun places to explore and play!